Show us how Pro-Expert toothpaste gives you the confidence of the expert! 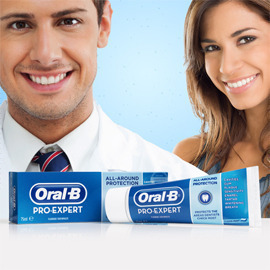 Oral-B Pro-Expert is no ordinary toothpaste. This super toothpaste provides superior cleaning and protection. It is clinically proven to protect gums and enamel, to tackle tartar and bad breath, help reduce plaque, and also to prevent cavities! This toothpaste gives you extra confidence, the confidence of the expert. We need your help to show to the world, in an inventive and witty way, that Pro-Expert is the toothpaste you need to get the confidence of the expert! Create a witty, unexpected and shareable video or animation that shows that regardless of the situation, Oral-B Pro-Expert gives you the confidence of the expert. Get creative and send us your video/animation before June 29, 2014 23:59 UTC time! Good luck to all the participants!